The most celebrated prehistoric site in Corsica, Filitosa is worth a visit for its megalithic menhir statues, which have been carved to represent human faces or armed figures. The purpose of these granite structures is still unclear, and mysteries abound concerning the many ancient structures on the site. 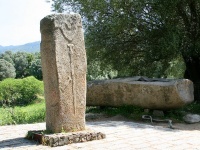 Filitosa V, with its sword and dagger, the face of Filitosa IX, and the five menhir statues around the foot of a 1,200-year old olive tree, are the most admired structures of the prehistoric site. A small museum offers further menhirs, as well as some ancient tools and pottery found in the caves, dating back to 3,300 BC. It takes about 45 minutes to walk through the whole site. There is a cafeteria and a gift shop at the site and it is a pretty area to explore. There is an audio guide in a number of languages to give visitors context. As the site is unprotected from the elements it is best to go on a sunny day, but try to avoid the peak hours because the serenity and mystery of this ancient site is far better appreciated without the crowds. Address: The site lies 11 miles (17km) north of Propriano, and about 25 miles (40km) south of Ajaccio.